Fork Lift Attachments Include Quick Tach & Universal Fit Forklift Buckets. As companies look to recession proof their operations and reduce overhead, unnecessary equipment purchases and rentals are the first things to be removed from next quarter’s purchase order. Loaders have become a cumbersome expense to most construction companies, who are beginning to realize the cost effectiveness and true versatility offered by forklift buckets. For less than it cost to rent a loader for two months, you can purchase a forklift bucket that transforms your extendable reach forklift into a material handling and loading device with greater range than standard loaders and far more adaptability to a number of mission critical applications. Everything from dumping trash into a dumpster blocked by debris piles to placing gravel on a large, flat rooftop can be quickly, safely, and be safely and quickly accomplished. We currently sell two types of forklift buckets: quick tach and universal fit (slip on the forks), described in detail below. These models are designed for "extendable-reach" forklifts and allow you to place material far beyond the reach of a loader. A heavy duty hardened beveled cutting blade on both the sides and the leading edge provides durability, strength, and resistance to wear and tear. Quick-tack fork lift buckets are reinforced by scuff bars along the bottom of the unit that shield it from abrasive wear. They can be used to replace that carriage and forks that weigh between 700-100 lbs. When installed, they free up more of the forklift’s load capacity so it can handle larger and heavier materials. 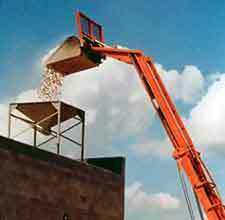 The Quick-Tach can dump materials approximately about 1.5 ft. higher because of the shorter depth of its bucket. Quick-Tach buckets are customized to specific makes & models of forklifts, so ask one of our construction equipment specialists about buckets for your make and model. These forklift attachments are ideal for ground level work on new construction sites. They can be used for sand and gravel loading, and they can be used for moving snow in northern climates. At the end of the day, the same forklift attachment can be used for jobsite clean-up. Consider the time this saves by switching tasks without having to switch tools and risk running into overtime. Universal Fit forklift buckets are also called “slip-on-the-forks” forklift attachment buckets. They can be used with any make and model of extendable reach forklift, so if your unit cannot be matched with a quick tach unit, we can locate a new or used Universal Fit bucket for you instead. Standard universal fork lift buckets attach to forks that are 48" long and up to 6" wide, but larger fork pockets can be ordered through an account manager upon request. Because universal fit forklift buckets slip on to the forks directly, they stay on the machine and are less vulnerable to damage. They are also 50% deeper than quick-tach buckets. This makes them ideal for carrying irregular shaped loads such as broken up concrete, elevating roof gravel, tearing off roof trash, moving large debris piles, and backfilling behind high walls. Talk to an Easy Rack construction equipment specialist now to see which style of forklift bucket best suits your needs.